Malcesine Italy is one of the most renowned villages in the Veneto shores of the Lake Garda: it is located in the north-eastern lake shore, just where the lake begins to narrow. The location is in the north of the picturesque Riviera degli Ulivi, all covered with a lush Mediterranean flora, mainly with olive trees. September 12th, 1786, Malcesine Italy. There is more than one reason why this picturesque small medieval town deserves a getaway. Among others, it has been certified with the Bandiera Arancione (Orange Flag) by the authoritative Touring Club Italiano. Only very charming small towns following strict environmental and tourist standards are entitled to receive that prestigious award. The beauty of the historic town, made up by a network of narrow alleys lined with medieval buildings hosting cafes and restaurants. All that overlooked by the imposing white 1200s castle, the Castello Scaligero.. Along with the Lombard villages of Riva and Limone, Malcesine is an authentic paradise for windsurfers and sailboat lovers, but also for paragliding enthusiasts, thanks to its constant winds blowing all year round. Its marvelous beaches. See for instance the one called Val di Sogno. Its suggesting position: Malcesine is set between the alluring blue of the lake and the relaxing green of the mountains, just where the olive trees and the cypresses blend into the steep Mount Baldo (2218mt/7277ft), which in turn falls sheer into the lake. The surrounding setting with the morainal Mount Baldo – known as the botanic garden of Europe for the variety of its flora ranging from the Mediterranean to the Alpine type - is very appreciated from mountains lovers and hikers as well. Do not miss a trip up to the mount, to enjoy a 360° view over the blue of the Lake Garda, feasting your eyes on an incredibly unspoilt landscape, a blaze of color and rocks. From Malcesine there is also the chance to climb up the mountain with the panoramic rotating gondola cableway, unique of its kind. If you wish, you are even allowed to bring on board your mountain bike. The last cableway stop is at 1750mt/5742ft, a starting point for plenty of hiking and biking trails. Taking a walk in the historic town of Malcesine is a good way to combine relax, wine and food passions, and interests in history. The narrow network of pedestrian alleys, typically Medieval, is overlooked by the dramatically evocative 1200s Rocca Scaligera, a crenellated castle built on different levels upon a craggy ground. 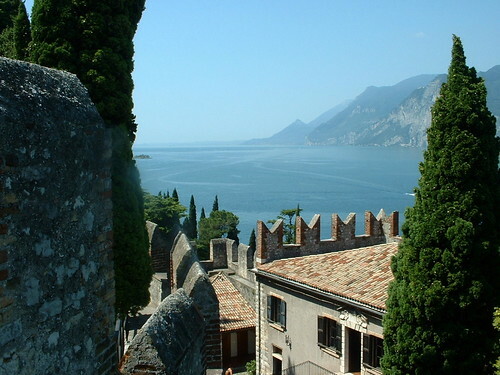 In its interior the castle hosts the Museo di Storia Naturale del Baldo e del Garda, which displays archaeological, geological and botanical finds. Plus, it hosts the Museo della Pesca - Fishing Museum – which among others exhibits some Venetian galleys finds. Furthermore, the castle hosts the City Library and the Biblioteca Goethiana (Goethe’s Library), with a collection of over 200 books belonged to the German writer. Finally go down towards the quaint small port and do not miss a romantic walk by the lively lakeside.